Many players have nagging things that can keep them sidelined for a day or two maybe even months .Most of time its usually run of the mill stuff. We all talk about kids not being 100 percent. It’s just that some health issues are more pronounced. It’s just a matter of how many you need to deal with, for whatever reasons. The power of recovery can help elite performance athletes rebuild muscles and recover after workouts and practices through correct nutrition. As a athlete one must understand the importance of good nutrition. The challenge to create the best nutritional diet for athletes that is functional, easy to follow and effective in almost any situation. You don’t need to be told how hectic life of a athlete can be. Between practice or a game there’s no time or energy to prepare six gourmet meals per day. On the go constantly, you’re lucky to have three traditional meals. Sound like you? If your main dietary concern is performance and getting enough quality calories, then I have an answer for you. Stop using lack of time as an excuse to not eat healthy. The following plan can’t be any easier to implement. If you say you can’t do it, you must really not want it bad enough. The diet works every single time if you choose to follow through on it. Feel free to make any required modifications based on your workouts and individual needs. The physiques and performance of today’s top NBA stars. They usually have muscular builds with very low body fat percentages body structures that allow them to have powerfull burst of energy on the court. It’s difficult to build muscle and stay less than 10% body fat. It’s actually impossible unless you have both a excellent diet and deciplned weightlifting plan. Most athletes, who develop amazing physiques, all share the following five superior dietary habits. Protein is the most important macronutrient you can eat when trying to achieve a lean physique. It builds muscle while increasing your metabolism so you can continually burn fat. You are not eating a real meal if your plate doesn’t have at least 20 grams of protein. Target to eat 0.75 to 1 gram of protein per pound of body weight. most of your intake should be from real protein sources (e.g., organiclly raised chicken, fish , eggs, turkey, quinoa, Greek yogurt and mixed nuts). 30 minutes after a workout, drink a protein shake or chocolate milk to quickly provide a flow of amino acids to your muscles. Each day you should consume a healthy fats and high level of protein .Carbohydrate daily intake should change with your day’s activity. Think about your body as a Mercedes . It requires a lot of fuel to drive around all day. But if the Benz sits in the car port, it won’t need fuel at all . Carbohydrates provide energy (e.g., fuel) for your body. So if you have a scheduled weight training, sprints or practice, you’ll need a lot of carbohydrates. But on light or off days, you require fewer carbs. You won’t use the extra fuel and it may be stored as fat. To get lean, you need to eat real, nutrient dense foods. The base of your diet should never be supplements. That is a costly mistake. If your diet is broken, no amount of supplementation will fix it. Use protein powder only in your post workout shakes. You may take a multivitamin to ensure you don’t have any vitamin and mineral deficiencies. Lean athletes eat breakfast every day. Numerous studies show that eating a high protein breakfast helps maintain a lower body fat percentage. The above information will work when you develop a food preparation strategy. Use the 3/1 split. Many athletes would enjoy this because of its simplicity. For every three hours you spend working out in the gym, you must spend one hour doing kitchen food prep. It’s not optional. The one hour spent in the kitchen should be thought of as a workout. You can prepare enough meals to last you for the next three days. Pair together full meals in individual containers so you can always grab a healthy meal on the go. Should you have trouble waking up early enough to cook breakfast, cook hard boiled eggs for an instant high protein breakfast. Separate servings of oats into plastic bags so you have them ready to go. Grocery shopping every three days. Of course, having the time to prepare, cook, and sit down to eat three nutritional, perfectly timed and perfectly balanced meals doesn’t always happen as planned which is why pre packed protein and energy bars are great options for snacking when you’re on the go. The best bar to have in between meals to stay optimally fueled, satisfied and healthy? Energy bars are usually more calorie- and carbohydrate-dense to provide you with your body’s preferred source of fuel (glycogen) while keeping you energized and satiated until your next meal.Energy Bars, which are generally made up of fruits, grains and other carbohydrate-rich foods, are the perfect snack to have about 30-45 minutes before exercise, and are especially great for fueling running and other activities where you’ll be moving for long periods at a time. Protein bars, on the other hand, are best to eat after exercise as they contain an optimal dose of muscle-building protein and other nutrients your body needs to repair and recover from your workout. Protein bars, which contain some form of milk derived or plant based protein like whey, hemp, pea or rice protein, make a great snack about 30 minutes after your workout, or during the day if you need something more satiating in between meals. 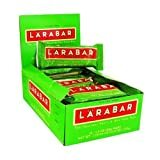 With thousands of types and brands of energy and protein bars on the market, it can be hard to sift through the variety to find a bar that not only has the nutrients you need to be fueled and full, but also tastes great and is affordable enough to buy in bulk so you’ve always got something on hand for snacking. Clif recently released its new Whey Protein Bar that comes in three flavors: coconut almond chocolate, peanut butter chocolate and salted caramel cashew. These tasty bars, which include no GMOs, are stocked with 14 grams of complete protein, including whey, pea and organic brown rice protein and include 5 grams of sugar. It’s the perfect on-the-go protein snack, particularly should the 20-gram soy protein-based Clif Builder’s bar is a lot for your stomach to take on. Quest Nutrition’s Chocolate Chip Cookie Dough Protein Bars are a popular in the bodybuilding community, since you get 21 grams of protein, no added sugar and only 4 grams of net carbs per serving thanks to Isomalto-Oligosaccharides, a natural prebiotic fiber that gives the bars their sweet taste and chewy texture. 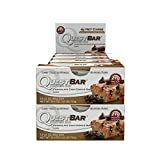 Quest Nutrition Chocolate Chip Cookie Dough Protein Bars which really do taste like you’re eating chocolate chip cookie dough are made with high quality whey and milk protein isolates and contain real chocolate, cocoa butter and almonds for only about 190 calories per serving. With no added sugar, no gluten, no soy, no dairy, no GMO and no B.S., RXBARs food one of the best you can get when it comes to protein bars. Each Chocolate Sea Salt RXBAR contains three egg whites (12 grams of egg white protein), six almonds, four cashews, two dates and a bit a cacao and sea salt for just 200 calories. RXBARs are paleo-friendly as well as Whole 30 compliant. With 15 grams of plant-based protein, 2.5 grams of muscle-repairing BCAAs and 2 grams of glutamine, Vega Sport Protein Bars are the perfect post-workout snack for vegans and non-vegans alike. 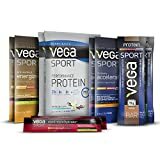 Vega Sport Protein Bars have the flavor and consistency of a chocolate bar (Chocolate Mint is a favorite), and taste more like a treat than a muscle-replenishing snack. They make a great meal replacement bar if you’re on the go, as they contain about 250 calories and 30 grams of carbohydrates to keep you fueled. If you need something more substantial than a banana to tide you over until your post work run or walk , eat a Vega One Meal Bar an hour before you head out the door. Each Vega One Meal Bar has 12 grams of protein from sprouted whole grain brown rice and pea protein, as well as 4 grams of fiber to keep you satiated until dinner. Heading out for dinner after your run instead of salad? Each chocolate coated and fruit filled bar also contains a serving of greens made from real, whole food spinach, broccoli, alfalfa, and kale. Just like grandma used to make, CLIF’s Energy Bars are reminiscent of old-fashioned, home-baked cookie goodness packed with pack 23 vitamins and minerals, 5 grams of dietary fiber, 43 grams of carbohydrates, and 10 grams of protein to keep you going between meals or during any kind of endurance exercise. 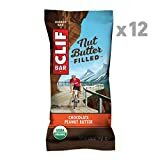 A great bonus CLIF Energy Bars are also non GMO. Looking for a healthy sugar boost before a run or hard workout but your fruit bowl is empty? Then grab a Larabar Snack Bar in Apple Pie flavor as a convenient alternative, as one bar is equal to half a serving of fruit. Larabar Snack Bars are made of a delicious blend of unsweetened fruits, nuts and spices for just 200 calories, and contain 4 grams of protein and 5 grams of fiber per serving. They’re also gluten free and non GMO, contain no added sugar and are low in sodium. Best For: Organic On-The-Go If you love energy bars but not the crash you might get after from having too many simple carbs and sugars, give Organic Food Bar’s Vegan Bar a try. These tasty bars are made with certified organic high quality agave nectar, which has a lower glycemic to allow for a stronger, steadier energy boost all day long. Made of all organic real food ingredients, such as almond butter, pea protein, pumpkin protein, flax raisins and quinoa, these bars would make the perfect snack before a long run or ride. If you consider yourself as a passionate online shopper like myself,Ebay has amazing deals on the best products.I hoped you enjoyed the Best Nutritional Diet -A Basketball Player’s Guide To Staying Healthy article and if you have any questions and want to leave a comment or want to leave your own personal review,please leave a comment below . Great article and some really good information, not only for athletes but for those of us who have a naturally fast metabolism. I have always been underweight and have gained weight and kept it on by following the guide you have. I really depend on energy bars to keep me going without having to burn what little fat I do have. I think nutrition is a difficult subject to write about, because everyone is different and what suits one might not suit another. For instance I run 3 to 4 times a week and do resistance training twice a week, I normally do this in the morning if I have breaks before this I feel unwell. Others might be able to eat before exercise but it does not suit me. Absolutely Bill we each have different routines .At the end of the day its all about maintaining a healthy diet as much as the schedule allows . Listen and do what is best for your body . Thank you I appreciate the feedback Matthew . If you wish may share with other budding athletes involved sports who might get something from this article .Cheers! great advice! sounds like a good eating plan in general but I have kids who, while still young are interested in sports so I love having an outline of a food plan that will keep them going at their very best! Lately I have been getting into boxing at the gym several days a week ( LOVE IT!) so it might be a good diet outline for our whole family no matter what sport they fall in love with! thank you! Thank you for your comment Mercy regarding protein intake and balancing carbohydrates.Yeah its constant running for sure in soccer combined with a balanced diet should get you lean and fit this summer.Love soccer/football its my favorite sport . Go Arsenal Gunners and Nigeria Super Eagles!